Fultondale, Ala.—When it comes to choosing the right bow there are certain characteristics that discriminating hunters look for. Speed, forgiveness, a smooth draw and a quiet shot are just a few. However, finding them all in one place can often prove very difficult. Fortunately, the new 2015 BLADE from New Breed Archery makes the search easy. It has them all. With a distinctive look, the BLADE sets itself apart from the competition with its cutting edge gusset brace riser, titanium bolt kit with stainless steel hardware, a fluted riser, two-piece extended pocket design and an adjustable cable guard. Together they provide the foundation for one lethal hunting bow. Building on that platform, the BLADE is powered by the Bionix Reactor modular two-track rotating/adjustable cam system, which launches arrows downrange up to a blistering 335 fps. Shooters will immediately notice the rock-solid back wall that delivers shot-to-shot consistency and accuracy. This means one thing….more trophies for the wall. What’s more, the BLADE, along with every New Breed bow, is made in the USA and hand assembled by one person from start to finish using only the highest quality parts available. No mass-produced assembly lines. Additional features include a zero-torque grip design, T6061 aircraft grade aluminum machined riser, premium Gordon Glass split limbs, custom-made premium strings/cables from String Addictions, adjustable string suppressor, front and rear inserts for custom weight additions and BowJax grips/dampening system. Throw all of this together and you have a hunting bow that is sure to deliver when your next trophy buck steps into range. Visit your local New Breed Archery dealer and experience the BLADE for yourself. No Hype, Just Hunt! Draw Weight: 50, 60, 65, 70 lbs. For more information on New Breed Archery’s BLADE and the complete line of New Breed Archery Products, contact New Breed Archery at (888) 363-3545 or visit www.newbreedarchery.com. For Hi-Res images and all media related requests, please contact Eddie Stevenson at eddie@driftwoodmediacom.com or visit www.driftwoodmediacom.com. Perryton, Texas– Republic Forge, manufacturers of world-class, American made, Model 1911 pistols, is pleased to announce full production of their officer’s model 1911, the General. Ideal for concealed carry use, the General will offer you all the luxuries expected from a full size 1911, while providing unique concealment capabilities. Don’t let the size fool you; accuracy and dependability have not been sacrificed! The General is offered in .45 ACP exclusively and features a match-grade 3 ½” barrel for quick mobility, 25 LPI checkering on the front strap, serrations on top of the slide, a wide array of custom finishes and color coordinated VZ or various Ivory grip options. The General has a retail price starting at $2,795, and is currently Republic Forge’s most compact 1911. The General offers exceptional precision and reliability, which you can customize on your own. 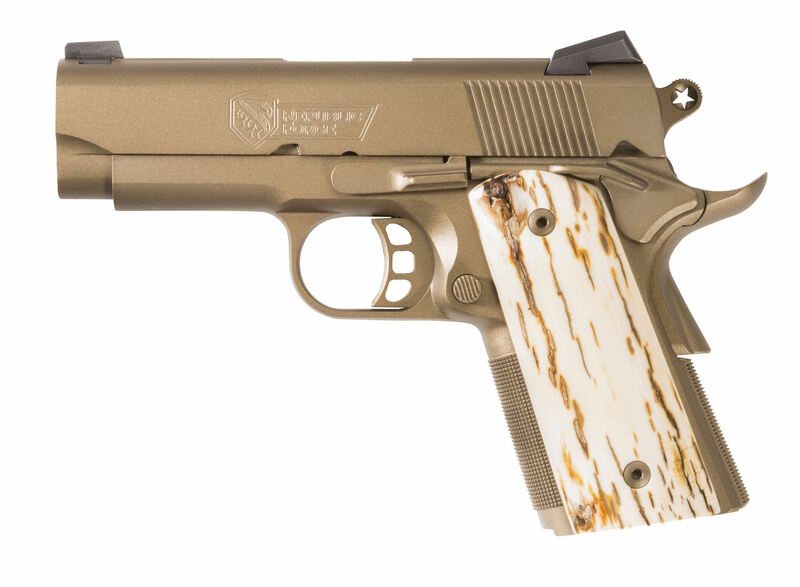 Unprecedented in the custom 1911 market, firearms enthusiasts can navigate to http://www.republicforge.com and build their very own Republic Forge Pistol. With user-friendly navigation and an unparalleled collection of customizable options, the “Build Your Own” application will transform your next firearm purchasing experience. Fultondale, Ala.—Hunters looking for a bow that is short in stature yet long on performance is a common scene in the archery world. After all, treestands and ground blinds don’t always lend themselves to ultra-long setups. As a consequence, the trend in short axle-to-axle bows remains popular. However, bowhunters looking for a short, maneuverable bow still want one that packs a punch while remaining quiet, easy to draw and forgiving. For them, we proudly introduce the New Breed Archery LYCAN. Like its definition, the aptly named LYCAN possesses enhanced strength, reflexes, coordination, speed, agility, durability and endurance. In other words, it’s a beast in the whitetail woods. With a forgiving 6 3/4–inch brace height, up to 327 fps IBO speed rating, an axle-to-axle length of 31 ¼-inches and the smooth drawing characteristics and rock-solid back wall of the Bionix 2.0 Modular Cam System, the LYCAN is the perfect blend of compact size and exceptional shooting performance. Exactly what today’s bowhunter wants. In addition to it’s hard hitting personality, the LYCAN also features our new two-piece limb pocket design that not only improves overall mass weight but increases limb-to-riser stability as well. Both of which translate to one thing….more punched tags. And like the rest of the New Breed lineup, the LYCAN comes standard with a titanium and stainless steel bolt kit, reducing weight, adding stability and allowing for bow use in all weather conditions without fear of rust or corrosion, custom-made premium strings and cables from String Addictions, an adjustable string suppressor and BowJax grips. And don’t forget it is made in the USA and hand assembled by one person from start to finish using only the highest quality parts available. No mass-produced assembly lines. Visit your local New Breed Archery dealer today and experience the hard hitting, compact LYCAN for yourself. No Hype, Just Hunt! 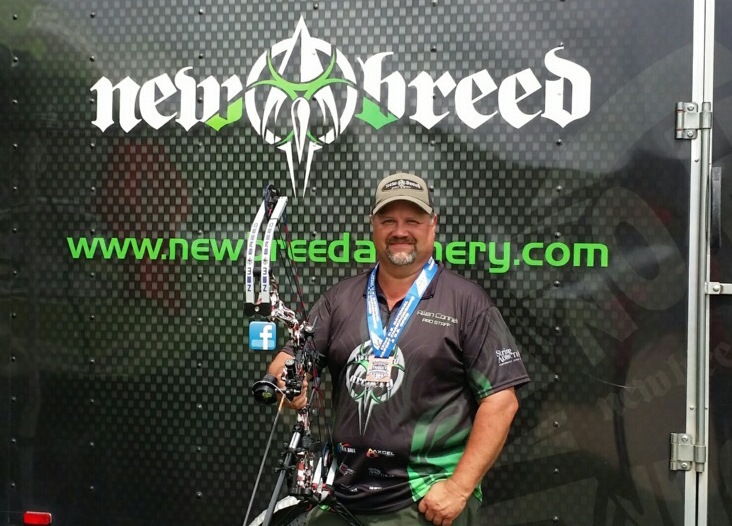 For more information on New Breed Archery’s LYCAN, and their complete selection of archery products, visit www.newbreedarchery.com or contact Eddie Stevenson at eddie@driftwoodmediacom.com. Fultondale, Ala.—Fresh off a first-place finish at the Illinois ASA Pro/Am, Allen Conner once again found himself on the winner’s podium at the 2015 USA Archery Outdoor Nationals. Competing in the Master’s Division, Conner placed bronze in both the 131st Target Nationals and US Open Championships. With a total score of 139 for the Target Nationals, Allen edged out fellow American, Gary Rigney on his way to the bronze medal, solidifying his place in the US Open Championship. Ranked third going into the US Open, Allen survived the elimination rounds on his way to yet another medal finish, shooting a final score of 145 in the bronze medal match. “We were extremely proud of Allen’s performance in the Target Nationals and US Open Championships,” said Kyle Null, president of New Breed Archery. “Allen has been the leader of the New Breed Professional Staff from the beginning; it was very special to see him representing New Breed so successfully on the national stage,” continued Null. Allen will look to build on his current hot streak as he leads the New Breed Shooting Team into the second-half of the 2015 tournament season. For more information on New Breed Archery and their complete line of products, contact New Breed at 1-888-363-3545 or visit www.newbreedarchery.com. Fultondale, Ala.–Although costly, it isn’t uncommon for shooters to own two bows, one for bowhunting and the other for the 3D or target range. And while each bow may perform in their respective area, neither can do it all. That is of course unless one of them happens to be the New Breed Archery ECLIPSE. In short, it was designed specifically to “do it all”. For starters, with an IBO velocity up to 335 fps, the ECLIPSE carries enough speed to make errors in range estimation less costly whether on the line or in the field. But, unlike some bows, that speed doesn’t come with a reduction in shooter friendly qualities. In fact, the Eclipse is anything but challenging to shoot. With a highly forgiving 7-inch brace height and an ultra-stable axle-to-axle length of 35 inches, the ECLIPSE is extremely accurate, easy to tune, forgiving after the shot and well balanced no matter what environment it is placed in. And, like other bows in the New Breed lineup, the ECLIPSE features a rock-solid back wall and is silky smooth to draw thanks to the Bionix 2.0 Cam System. Additional qualities include Premium Gordon Glass Split Limbs, the new titanium and stainless steel bolt kit, fluted riser, new two-piece limb pocket design, custom-made premium strings and cables from String Addictions, an adjustable string suppressor and BowJax grips. And, like all New Breed Archery bows the ECLIPSE is made in the USA and hand assembled by one person from start to finish using only the highest quality parts available. No mass-produced assembly lines. Undoubtedly, the need for separate bows for hunting and target shooting no longer exists. That is…only if you’re shooting the ECLIPSE. Visit your local New Breed Archery dealer today and experience the ECLIPSE for yourself. No Hype, Just Hunt! 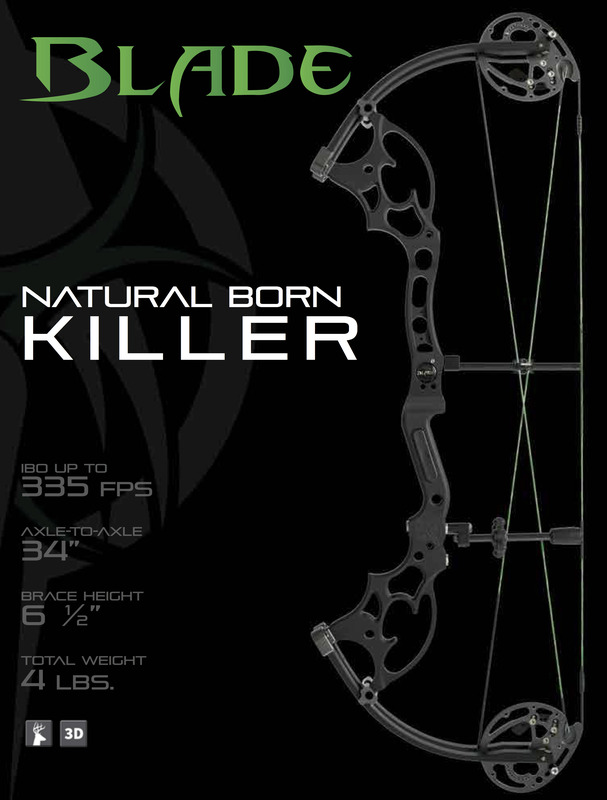 For more information on New Breed Archery’s ECLIPSE, and their complete selection of archery products, visit www.newbreedarchery.com or contact Eddie Stevenson at eddie@driftwoodmediacom.com.